I’m the oddball who’s always loved math. My favorite part of math is the every day, how math explains the world around us. So it is important to me was instilling that same love in my kids. I resisted buying workbooks for my kids until elementary school was around the corner, but I do bring math into the every day. What are some activities you can do that teach your kids math skills without feeling like you’re teaching? Young Toddlers. The most important skill at this age is learning the numbers verbally, counting to ten or twenty, and developing one-to-one correspondence. There are ways to do this in a natural way so that your child picks up the numbers without realizing it. Ask open ended questions. Ask your children how many of an item they want. Start with a choice, such as one or two, and move on to a generic “how many”. You’ll be surprised how soon your child can ask for one, two or three of something. Count together. Start by counting aloud when you measure things, for instance coffee in the morning. Then, count the world around you, whether food (jelly beans! blueberries!) or flowers on the tree. “Wow! Look how many lemons are on our tree. One – two – three…“ as you point and count them up. When your child counts small objects, encourage pointing at or touching each item. Matching. Matching teaches children to recognize patterns, which is a predecessor to more advanced ordering. Spot It is a great way to practice and builds the skills needed for number-based concentration. Preschoolers. Preschoolers can often count to ten or fifteen without trying and are ready to learn bigger concepts if it’s done in a natural, fun way. Baking is fractions. Measure out ¼, ⅓, ½, using measuring cups and measuring spoons. Use both separate cups and the glass ones with lines, as they are different ways of visualizing the same thing. Don’t do this as a lesson, but as part of recipes so that it’s a fun, natural learning process. 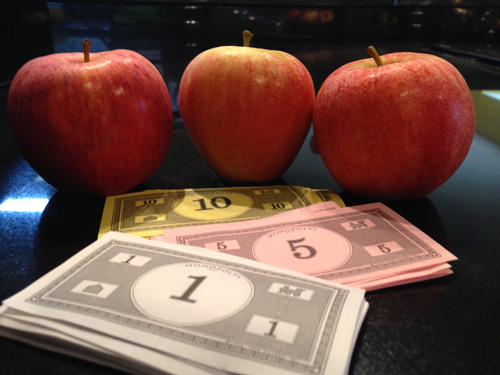 Apple Fractions is a fun book to get you started, using apples to explain fractions! Games are fun. At this age, my elder started to love games such as Zingo 1-2-3, Chutes and Ladders and concentration. Buy a deck of cards so that you can start playing games such as Go Fish and Crazy Eights. Matching cards is great, as well as counting up who has the most pairs. Develop number sense. Pinterest is a gold mine for activities that encourage kids to count a number of objects and identify the corresponding number. The Measured Mom web site has fantastic activities sorted by concept. PreK/Kindergarten. At some point, your child will be comfortable with basic numbers and have a longer attention span. For every child, this is at a different point, so don’t feel the need to rush your child forward if he’s still grasping numbers while another child his age is doing advanced math. Children bloom at different ages, and most catch up in their own time. Count change. When you buy something, count the change when handed to you. You can also talk about the value of coins such as a penny, nickel, dime and quarter as you put them into your child’s piggy bank. For bigger numbers, try the book Millions, Billions and Trillions. Arithmetic is around us. Ask your child to eat four pieces of fruit. If you give him two blueberries, how many more are left? If three family members each want two sausages, ask how many total should you pull out. If you have nine marshmallows and three children, ask how many each child gets. (Buy small marshmallows!) Continue to do fun math problems adding, subtracting, multiplying and dividing things in the house. Adding and subtracting are easy; give each other more or less food, toys or cards. “If I have ten strawberries and share three with you, how many would I have left.” Double a recipe to practice multiplication, or share items among the family to practice division. Compare the speed of different toy cars. Have a race. Bedtime Math will get you started: Bedtime Math: A Fun Excuse to Stay Up Late and Bedtime Math: This Time It’s Personal. Favorite games can be more advanced. My children love Uno. For children who have a natural affinity with numbers, go for a game with money, such as Monopoly Jr or The Game of Life. Above all things, keep it fun and related to the world around you to encourage a love of math. Happy counting!